Researchers suggest the experience of tripping on magic mushrooms is unique for each person. This post from Science Alert highlights the good, the bad, and the ugly. There’s evidence that tripping on magic mushrooms could actually free the mind. 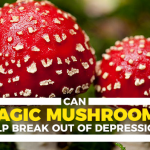 Several studies, including two promising recent clinical trials, suggest that psilocybin – shrooms’ psychoactive ingredient – may hold the potential to help relieve severe anxiety and depression. Still, because they’re classified as Schedule 1 – meaning they have “no accepted medical use” and are illegal – it’s been pretty tough for scientists to tease out exactly what they can and can’t do. Like other hallucinogenic drugs, such as LSD or peyote, shrooms are thought to produce most of their effects by acting on neural highways in the brain that uses the neurotransmitter serotonin, according to the National Institute on Drug Abuse. More specifically, magic mushrooms affect the brain’s prefrontal cortex, part of the brain that regulates abstract thinking, thought analysis, and plays a key role in mood and perception. Many users describe things like seeing sounds or hearing colours. 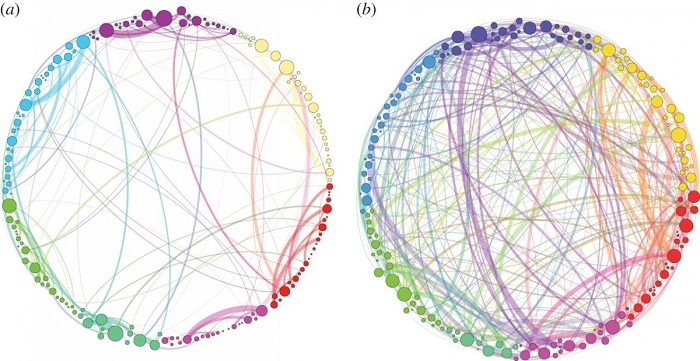 A 2014 study was one of the first to attribute this effect to the way psilocybin affects communication across brain networks. In people injected with 2 milligrams of the drug, researchers saw new, stronger activity across several regions of the brain that normally rarely or never engage in such ‘cross-talk’. To visualize what they were seeing in the people given the drug (as opposed to those given a placebo), the researchers created the representation above. Imperial College London neuroscientist David Nutt, who authored a 2012 study on psilocybin, also found changes in the brain activity patterns of people on the drug. While some areas became more pronounced, others were muted – including in a region of the brain thought to play a role in maintaining our sense of self. In depressed people, Nutt believes, the connections between brain circuits in this sense-of-self region are too strong. “People who get into depressive thinking, their brains are overconnected,” Nutt told Psychology Today. But loosening those connections and creating new ones, the thinking goes, could provide intense relief. A five-year study of the drug suggests it could work “like a surgical intervention” for mental illness. Six months after the experience, 80 percent of the Johns Hopkins participants showed significant decreases in symptoms of depression and anxiety, as measured by what’s considered a gold standard psychiatric evaluation. 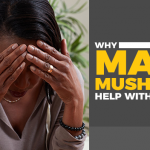 Some researchers think shrooms could also help relieve anxiety after they’re used. 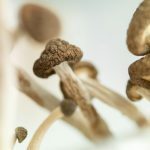 For a New York University study looking at how the drug might affect cancer patients with severe anxiety, researchers observed the effects of psilocybin on volunteers who received either a dose of psilocybin in pill form or a placebo. A re-enactment of the procedure is shown in the photo above. Nick Fernandez, a 2014 participant, says his trip took him on an emotional journey that helped him see “a force greater than [himself]”, he told Aeon Magazine. But you might also feel anxious – at least while you’re on the drug. 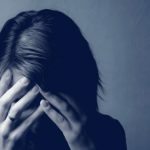 In many of the case reports from the NYU study, participants reported experiencing intense anxiety and discomfort – ranging from a few minutes to a few hours – during their trip. It was only afterward that some said they began to feel a sense of relief, and even this experience may vary significantly from each person. Shrooms can induce experiences that seem real but aren’t. These types of out-of-body experiences, in which users might observe a version of themselves, typically begin 20 to 90 minutes after ingesting the drug and can last as long as 12 hours, according to the National Institute on Drug Abuse. Experiences can vary based on how much you take, as well as by your personality, your mood, and even your surroundings. Some users have reported lingering hallucinatory perceptions that may be linked to a rare disorder called HPPD. 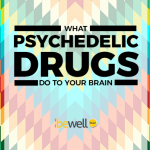 Since the 1960s, there have been scattered reports of something called hallucinogen persisting perception disorder – when hallucinations continue long after someone’s taken a hallucinogenic drug, typically LSD. 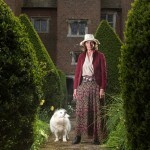 (There are also some anecdotal reports of it from people who’ve used shrooms).